For some years, researchers had believed that having cravings for a particular type of food may be an indication that you are missing a particular nutrient in your diet. For example, if you crave red meat then you may have an iron deficiency, or if you crave ice cream you must need calcium. Studies have shown, however, that cravings have nothing to do with a nutritional deficiency, but are actually caused by chemical signals in the brain. Nutritionist Karen Ansel says, “If cravings were an indicator of nutritional deficiency, we’d all crave fruits and vegetables. The fact that we all want high carb, high fat comfort foods, along with the research, is a pretty good indicator that cravings aren’t related to deficiencies.” Yes–it’s really all in your head. When you crave a food, the same reward centers in the brain that are responsible for drug and alcohol addiction are more active: the hippocampus (memory), the insula (emotion and perception) and the caudate (memory and learning). These areas are all very receptive to dopamine and serotonin, neurotransmitters that are responsible for feeling relaxed and calm and which spur reward-driven learning. The reason you crave things such as ice cream, potato chips and chocolate is that these items are full of fat and/or sugar. Both fat and sugar are involved in an increased production of serotonin and other chemicals that make us feel good. There is a large societal aspect to cravings as well. For instance, women in Japan tend to crave sushi and only 6 percent of Egyptian women say they crave chocolate. Approximately half of American women claim that their cravings for chocolate reach a peak just before their period. However, research has found no correlation between fluctuations in women’s hormones and cravings. In fact, postmenopausal women do not report a large reduction in cravings from their premenopausal levels. Studies have found that the more people try to deny their cravings, the greater the craving they have for the forbidden food. Researchers suggest that it is better to give in to the craving in a controlled way rather than denying yourself altogether. Just be sure to restrict what you consume to a reasonable amount. If your dopamine receptors are constantly bombarded with high-fat and high-sugar foods (or drugs and alcohol), they shut down to prevent an overload. This makes your cravings even greater and you end up eating more in an attempt get the same reward, but you never really feel satisfied. 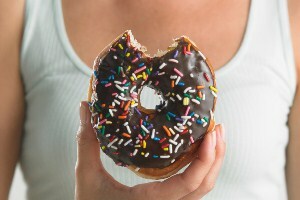 Exercise and distraction are two good ways to reduce food cravings. One study found that a morning workout can reduce your cravings for the whole day. Smelling a non-food item can also help. Keep a small vial of your favorite perfume with you when a craving comes on and take a whiff when the craving hits you. It will occupy the aroma receptors that are involved in food cravings.